For those of you who have fought Houston traffic, you’ll understand why I rode the bus from the northeast suburb of Humble/Kingwood on the days I had classes at the University of Houston main campus. It allowed me to ride instead of drive, therefore avoiding stress. It also let me sleep, study, think, and even meet people (there is a whole story about a piñata at a 5 year old’s birthday party I’ll recount one of these days). 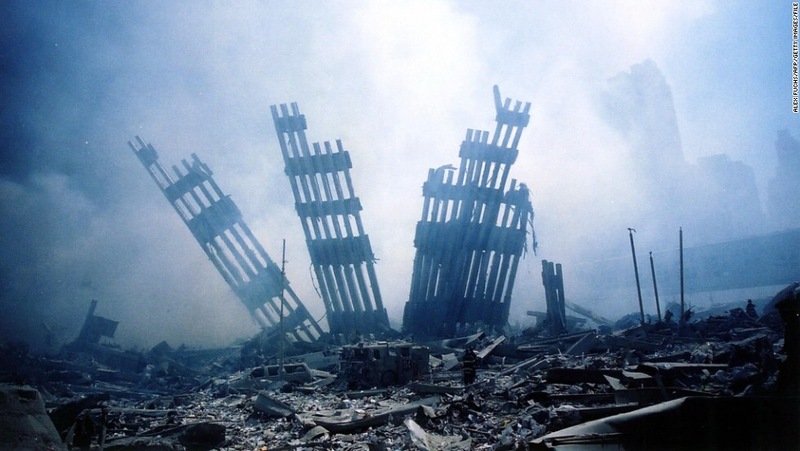 On the morning of September 11, 2001 I was sitting in my seat on the bus, and as we arrived to the downtown area I paid little attention to the activity of those around me as I blithely listened to my music and stared out the window. But after a few stops along Milam Street I started noticing people getting ON the bus instead of off of it…and I simply wrote it off as maybe there was a big conference meeting up at the Administaff (now Insperity) offices in Kingwood and people were getting on to head up there. I got off at my stop at Clay Street and started the 7 block walk to Jefferson Street where I got into a local bus and rode the remaining few minutes to the UH campus. Once on the campus I started walking from Cullen into the interior of the campus where my first class was to be held. As I entered the elevator I noticed a buzzing of conversation around me, but still I had my headphones on and wrote off the unusual talkativeness of my fellow Coogs for an extra cup of coffee that morning. Once I arrived to my African History class on one of the upper floors I removed my headphones and took a seat. I was a history major and so I was looking forward to learning more about the culture and empires of central and Western Africa that morning. I even got a little excited as the professor rolled in a TV cart, thinking we would watch a neat documentary about some buildings or events from that area long ago. The professor instead announced that we were going to watch the news as history was unfolding before us, right then and there. I was perplexed. What was she speaking of? And then she turned on the news. I saw two very tall buildings in what I could gather was the skyline of New York City. I had no idea what the World Trade Center Towers were. But I saw helicopters flying around as one of them burned. I thought briefly that it was a building fire that had gotten out of control, but as the replays began rolling I saw that it was apparently an airplane that had crashed into the tower. We watched for another few minutes when all of a sudden we see the second plane hit the other tower. I took a deep breath and literally remember thinking, man, this is a pretty elaborate and upsetting hoax to concoct. And then I thought, surely this is a preview for an upcoming movie. But as the minutes grew into an hour and the coverage showed both aerial and on the ground video and photos, I knew it was real. Even if I still couldn’t believe it. That is when it hit me. All the people boarding the bus instead of getting off were leaving the tall buildings of downtown in an attempt to possibly save their own lives if a plane was headed to Houston. And the talkativeness of the students wasn’t because of strong coffee but because of the disaster unfolding in NYC. And as I left that class and headed to the next, students were scurrying across the campus. Some going home, some finding available tv’s and some gathered in groups discussing the travesty. Then when I arrived at my next class, there was a piece of paper taped to the door announcing class was cancelled, so I headed to the University Center to grab a bite to eat and watch the news. As I sat at the bar of Harlon’s BBQ in the UC basement eating, I watched for hours as the events of that morning and afternoon unfolded…classes having been cancelled altogether at this point. Around 3pm I headed to the bus stop so I could make the trek home. The mood was somber and quiet. Many of us making eye contact but saying not a word. When I got home I headed over to watch the news broadcast with my parents and granny. And we huddled together in shock as details became uncovered and photos showed just how shocking this event was. I remember wanting to do something, but feeling powerless to do anything. I had just assisted in helping people who flooded during Tropical Storm Allison a few months before this, but NYC was so far away. I remember I did a lot of praying and trying to rally around organized efforts to send supplies, funds and notes of encouragement to the first responders and even to those who lost loved ones. I will never forget the way I felt that day. I’ll never forget the way America united, honestly, in a way not seen again until recently with Hurricane Harvey recovery efforts. And I will never forget how I viewed my role as an American, as a productive citizen and most importantly as a child of the most high God. God doesn’t send these tragedies to mankind. Much of what happens to us is a result of both a fallen nature and the sinful heart of mankind. He is saddened by these events, just like us. But in the midst of the turmoil He awaits eagerly with open arms ready to embrace those who will seek His face! And that is what I remember most, turning to Him and burying my face into His chest and just being comforted that He is in control of my eternity and that I must live in the now with a purpose and intention to share His love with those around me…because we are not guaranteed tomorrow.